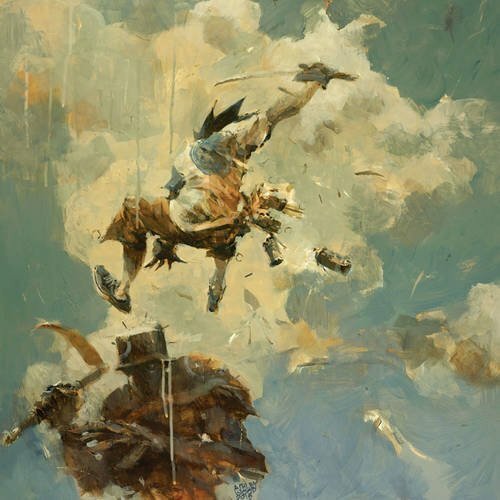 The Art of Tomorrow Kings is a typical artbook you would associate with Ashley Wood. There are old school robots inspired by the World Wars, gatling guns, long swords, long legs, Old Masters colour palette and the patchy style of painting. On closer look, the characters are actually Tomorrow Kings figures by 3A. I'm not familiar with the collectible figures of Tomorrow Kings. Perhaps that's why I feel that this book is very similar in style like many of Ashley Wood's earlier artbooks. Even the change of characters did not surprise me in any way. I went over to the website to see the Tomorrow Kings figures and they look pretty good. However when I look at the artworks here, it feels repetitive. I find it difficult to differentiate it from his earlier artbooks, especially those that also feature robots and long-legged lasses. And how many times do you have to draw robot heads being chopped off, or people standing on a gigantic robot head? The paintings take up the front portion of the book. The second portion features the usually sketchy ink drawings with lots of textures, half tone and cool handwritten text and speech balloons. Sounds familiar? A change of direction might inject some freshness into the work. It could be a change in style, colours or even subject matter. The sparse narrative in the book also does not help to build the world. I used to like the style but now I'm beginning to get that work-in-progress feeling whenever I see his artwork.